Instructions: Ready side fold card measures 8.25" x 7". To create card base, choose a pattern paper from the designer paper collection and cut a piece measuring 8.25" x 7". Mat it on white cardstock to create bendy frame, take a piece of smooth white cardstock measuring 10.25" x 7". Score 1/2" on both sides and cut a window using eyelet rectangle & basics die. Choose a pattern paper from the same collection and cut a piece measuring 9.25"x 7". Cut a window from the pattern paper using same die. Mat it on the base frame. To create window scene, stamp some tulip flowers using Vibrant Fuchsia ink on flower making paper and cut with coordinating die. Color the flower centers using Sunflower yellow ink. Color the edges of the flowers using Vibrant Fuchsia ink. 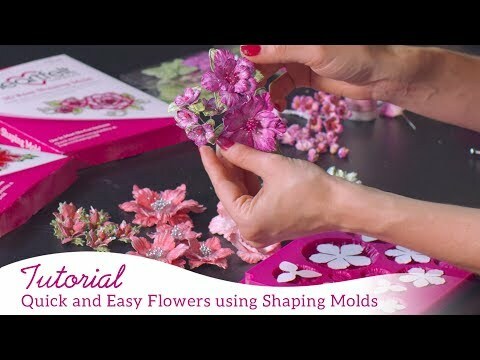 Shape the flowers using 3d Flower Shaping Mold. Stamp some tulip leaves using Olive Green ink. Paint the leaves with the Leaf Green ink and cut with coordinating dies. Shape the leaves using Deluxe Flower Shaping kit. Arrange the flowers and leaves and keep it aside. Stamp some fillers, cart, fence & tulip bouquet using black Archival on water color paper. Paint the images using Zig markers and cut with coordinating die. Glue the fence inside the bendy frame as shown in the picture. 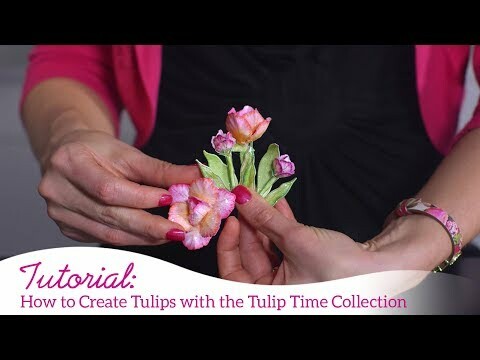 Glue flowers, tulip fillers and bouquets on the base card to create a window scene. Glue the frame on the base card as shown in the picture. Cut two decorative borders from white cardstock using Elegant Pocket Accents Die, and glue it on the both side of the card. Cut two borders from the white cardstock using Petite Pocket Accents die and glue it on the top of the frame. Glue the cart on the lower side of the frame and fill it with fillers and small tulip flowers. Cut a sentiment ticket from the same collection and mat it on the white cardstock. Glue a tulip bouquet and tulip flowers on the other side of the frame. Glue the sentiment ticket on the flowers using dimensional tape. Cut two tags from the same collection and tie it with satin cord. Mat the bendy frame on the side folded card base. For the finished look, apply glitter on the flowers using glue that dries clear.